Hans Uwe Hielscher (born 1945) is a German organist and composer, the organist and carilloneur at the Marktkirche in Wiesbaden since 1979, internationally known as a concert organist. Hans studied church music at the Hochschule für Musik Detmold, and Carillon in Utrecht. From 1969-1973 he was church musician in Juist and from 1973-1979 in Bielefeld. He has been the organist and carilloneur at the Marktkirche in Wiesbaden since 1979. He created a series of weekly free recitals called Orgelmusik zur Marktzeit (organ music at market time) on Saturdays at 11:30 a.m., in which he and guest organists perform seasonal music, more than 1500 events as of 2010. He has appeared in a regular concert on New Year's Eve together with his colleague at St. Bonifatius, Gabriel Dessauer until 2010, whereas he played with his successor Thomas Jörg Frank since 2011. In 1985 Hans worked at the Immanuel Presbyterian Church in Los Angeles in exchange with Samuel Swartz, and he has been teaching at the University of Redlands in California since 1986. 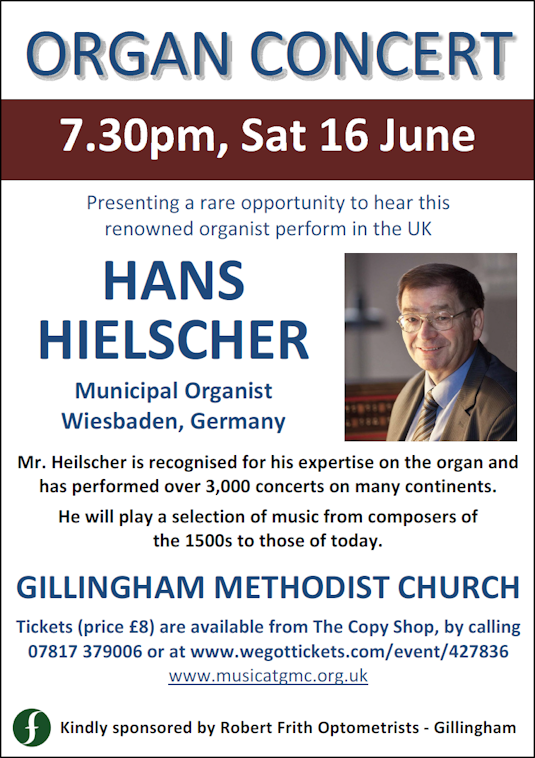 Hielscher is active as a concert organist and has played more than 3,000 organ concerts worldwide. We were very pleased to welcome him to GMC.